On Saturday, November 19, 2011, I was interviewed by host August Rosado of the BlogTalkRadio show Signs of the Times. August is a Bible prophecy teacher and preacher and founder of a ministry called Today in Bible Prophecy. He has and continues to be a personable guest on our television program Christ in Prophecy. He and I spent some time discussing the proper way to interpret the Bible. 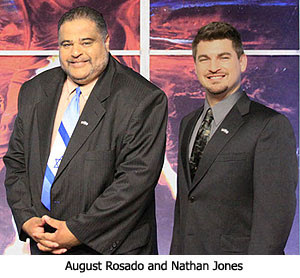 August Rosado: We have those who approach the Bible literally and those who approach it figuratively or allegorically. How should we approach the Book of Revelation? Nathan Jones: I believe that we need to approach it literally like anything in the Bible. Certainly there are poetic parts to the Bible and we need to take them as such. Certainly there are symbolic parts of the Bible, but usually when there is symbolism the other Bible verses will explain what the symbolism means. So, we need to take the study of Revelation literally. Obviously, the Antichrist isn't a giant beast that is trumping and stomping the planet earth, but he is like a giant beast. John was a First Century man who was trying to put a 21st or whatever century it will be pictures into words and trying to help us reading his revelations understand them. Revelation interpretation can be difficult, and admittedly Revelation is a difficult book, but I believe the Bible supports that we need to take a literal interpretation of the Bible. We have a saying here at Lamb & Lion Ministries: "If the plain sense makes sense, look for no other sense, otherwise you will end up with nonsense." August Rosado: I love that! Nathan Jones: That is what happens when people take an allegorical view of the Bible. or they spiritualize the Bible by creating whatever meaning that they want to create. They create in their minds their own ideas of what the Bible should say, and not what the Bible is actually saying. That is being like God. We can't be like God and should not make up whatever we want about the Bible. Just take the Bible for what it says and follow that rule, and that's the best and most important and I'd say only way of interpreting the Bible. August Rosado: So, what you are telling us is that the approach to the Book of Revelation should be the literal interpretation. I agree with you on that. We should approach the Book of Revelation from a literal point of view. I love when Dr. Reagan says that saying on TV, "If the plan sense makes sense, don't look for any other sense, or you will end up with nonsense." And, Folks, there is a lot of nonsense out there when it comes to the study of Bible prophecy. As Nathan said, when you allegorize and you spiritualize Scripture, you are making yourself God. You put yourself in the driver's seat. You are in control. You can come up with any form of doctrine that you want. But, you're wrong. Proper, literal interpretation of the Bible is something that we really need to be careful about. Always approach the book of Revelation from a literal point of view. In the last part of this Interview by August, we'll discuss Iran and the Palestinians in Bible prophecy. I definitley agree that Revelation will be literal events. Just look at the Old Testament, God used literal events. But I also see these literal events as being a result of the spiritual content of man/world. The First Trumpet: Rev. 8:7 " The first angel sounded, and there followed hail and fire mingled with blood, and they were cast upon the earth: and the third part of trees was burnt up, and all green grass was burnt up." I believe this is literally happening on earth-but as I study the symbolism of hail, fire, blood, earth, trees, grass as seen throughout the bible it gives a clear picture of the spiritual nature of man. Here goes: The first angel sounded, and there followed falsities from evil; the evil of cupidities together with falsified truths, and they were cast upon society: and third part of the knowledges of truth destroyed by the evil cupidities, and memory-knowledge of truth likewise destroyed. To me this sounds just like the Apostasy that is going on in the Churches now. Of course it is definitely not as simple as all this but it does show how God reveals in the earthly/fleshy state the contents of our hearts and true nature. This is just food for thought not doctrine or preaching. I just love the mystery of our Lord. Also I do believe in the literal events in Revelation-I'd have to be ignorant if not- it is happening all around us-literally. These comments are just to maybe awaken a few who spiritually are still asleep and think they have time... remember it will happen at a time we think not. Great to share--I hope you take this in the love that it is sent--in no way do I hope to take away or add to what it written in God's Holy Gospel. The most important verse in Revelation is 1:19. This verse is the key verse in helping to understand where everything should be put in its proper place. "Write the things which you have seen" concerns Chapter 1, "and the things which are" concerns the Churches Chapter 2&3, "and the things which shall be hereafter", this concerns events after the Rapture of the Church,which includes the Great Tribulation and Eternity everafter, Chapters 4-22.